It’s officially summer. This means that I make the move from my “in-the-house” writing space, (which is really the bedroom of my daughter who is at college) to my sanctuary, a studio room above the garage. 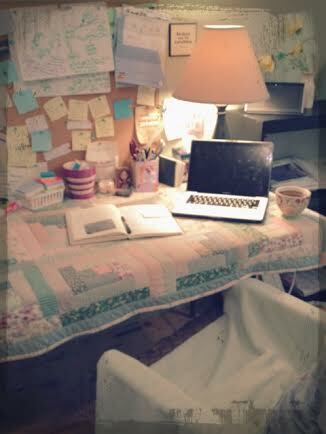 We do not heat the room above the garage, so every fall I migrate to the indoors to write and create. It’s always a sad move saying goodbye to my own personal sanctuary, but the move back to this space in the summer is a filling of my heart and soul as I greet my home. I feel the layers of the winter’s old energies melt off of me once I am back to the studio. Stacey Shubitz shared her writing area at Two Writing Teachers a couple of weeks ago and this inspired me to share mine. Seeing others’ sacred space is a visual inspiration that gets juices flowing to clean up our own spaces. Or, move to another one. Let me tell you about my space. It’s not fancy, but it works for me. The table is one of those $35.00 tables you can buy at Walmart. It’s white and we have several that we’ve used for graduations. I’ve draped it with a small quilt I made years ago. I love the softness of it. The quilt also is a reminder to me to slow down (examining the small stitches around each Log Cabin block does this). When my kids were small, I did a lot of hand quilting ~ for therapy mostly. Hand quilting calmed me and was my creative outlet. The chair is a lawn chair. A comfy one because I sit on a pillow and cover the arms with a fleece blanket. Again, cozy cozy. Comfort, a priority if I’m going to sit myself down to write. 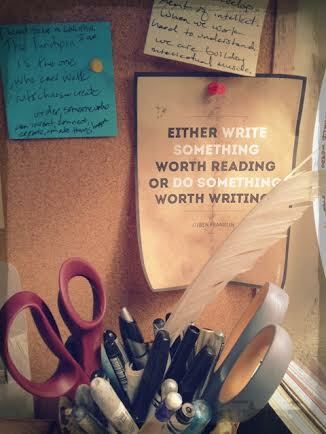 A writing alter sits before me, each object having significance in my space. Always, a candle is lit. A lit candle is a reminder that my own light shine through in my writing. I prefer sage candles as they tend to clear any negative energy as well, but right now, my sage candle is spent. My back up candle here is creamy vanilla and it makes me hungry for cake. Not a good thing when you are trying to write. Note to self: buy more sage candles. Also here, is my writing angel. I call her in and she sits by my side. 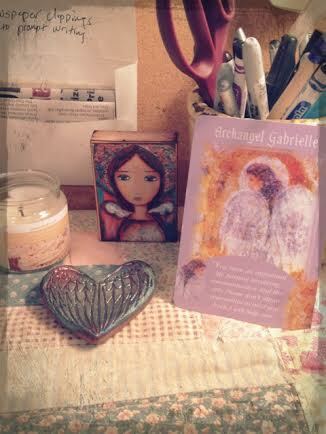 Archangel Gabrielle is the angel of communication. If I ask, she helps me to quiet Bernice (my mind) and all of the insecurities that hold me back. You will also see a heart with wings, made from clay, sit upon my alter. I am a touchy-feely person and holding this heart and saying a prayer to God to allow me to speak from the heart is so important. If I know I am speaking from the heart, I do not worry so much about what others think of my words on the page. 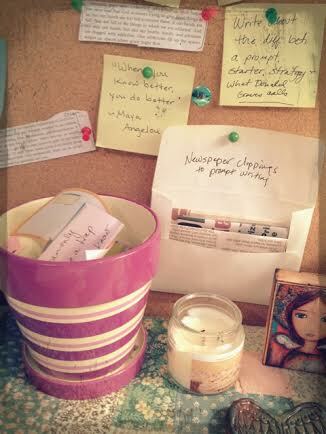 There are inspirational messages tacked up on my walls of my writing space and tissues for when tears penetrate through my writing (love it when that happens). 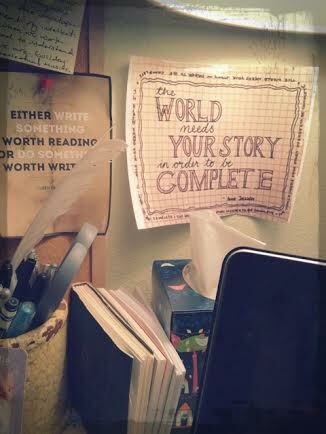 A small notebook is handy as it holds some snippets of words from other writers that caught my eye. These words find their way into my writing. Of course, I get stuck when not knowing what to write about. Collecting tidbits for ideas is an obsession for me. 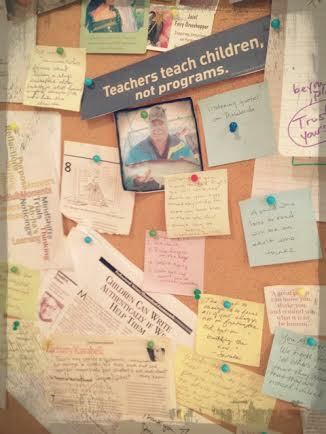 I tack them on my bulletin board, toss them into a flower pot and save newspaper clippings in an envelope. Most of the time, I write about something pressing on my mind at the time, but quite often, I need to just pick something and see where it takes me. There are two other spaces that I need to get set up in my sanctuary. One is for art journaling/painting and the other for sewing. I tend to have to jump between these creative outlets. 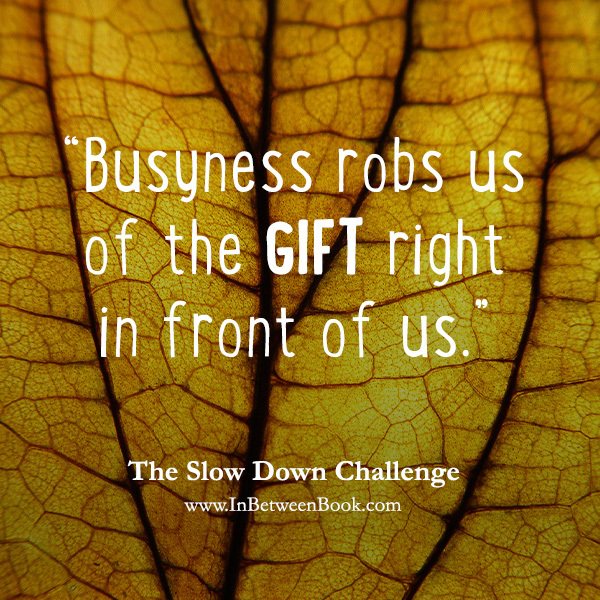 When I’m stuck in one, I navigate over to the other. But most of my time is here, writing. Loved this! Will this be your first time through tribe writer’s? You sound like a pro. I started in November and stopped because I got stuck on the EBook lesson. I’ve been staying plugged into this group here on Facebook and growing so perhaps I’ll see you back in class. What a wonderful little niche you have created for yourself. You have inspired me! My husband just recently retired and we just bought a new home. Since we are empty nesters, he said one of the bedrooms would be perfect for writing–it over looks a pond. My sacred writing place has been the kitchen table for the past 25 years. I’m a little afraid I’ll be like Chevy Chase in Funny Farm and go totally down writer’s block road! Ha! I LOVE the flower pot idea. Sorry for the long post. I really enjoy your blog. Thank you for visiting and commenting on my writing, Dawn. Thank you, Shelley, for your kind words. You are spot on with having to keep our juices flowing ~ daily. And my dear friend, Bridgette Doer, worked hard with me in overcoming my fear of others’ thoughts and taught me that if I truly speak from the heart, I shall not fear, as God’s love is in those words. Oh, I feel for you! Having all of your personal spaces in disarray and not having a hideout for writing is painful! I am sure that your next home will include a most perfect writing space for you. It’s just waiting. Thank you, Crystal. ❤ Be sure to share your space when you are ready! Love this space and your signals for yourself to slow down, be inspired and to honour creativity. Looks like a lovely space to be in!